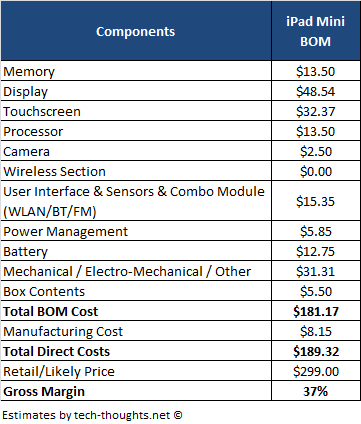 Well, I can’t say I expected to see something written about the build costs of the un-announced and only rumoured iPad mini… but today, I see that someone has added together the cost of all the leaked parts and estimated that it will cost Apple $189.32 to built each iPad mini. The iPad mini has been rumoured to cost $299 when launched… and I will add “if launched” to that as it has been rumoured each year since 2010 without being launched yet. The prices were calculated based on the estimated prices of the Nexus 7 tablet which brings in a number of errors in to the whole thing. But, to be honest, when we are talking about a tablet that “might” launch and “might” have a price tag of $299 then I think it is safe to assume that the build cost “might” be around the $200 price mark considering Apple will unlikely sell the iPad mini at a loss. Apple has no reason to make a loss on this product as the strength of the iPad name will surely be enough to grab peoples attention. Don’t you just love speculation. Either way, the calculations on Tech Thoughts make for an interesting read for those interested in the inner working of how prices might be calculated.